Expendables takes you into the inner-workings of a man, where the thought process in a fight is to punch the guy in the face who is clearly on fire. Why? Because you are a man. It’s where the thought process says that when a guy is taking six shots to the body, he still needs a poorly computer generated knife to slide through his chest cavity. Why? Because you are a man. Expendables is a film of many titles, potential winners being Stallone vs. Austin, Li vs. Lundgren, or Rourke’s Quick Tat, because apparently getting a tattoo lasts all of 30 on-screen seconds. Why? Because these guys are men. The plot here exists because it existed in every ridiculous action movie, the American rich guy takes over a small country to sell drugs, and a good guy goes in to kill everyone and save the day. The difference? Expendables has five good guys going into to kill everyone, instantly elevating the testosterone, brutality, and kicks that snap people’s necks. 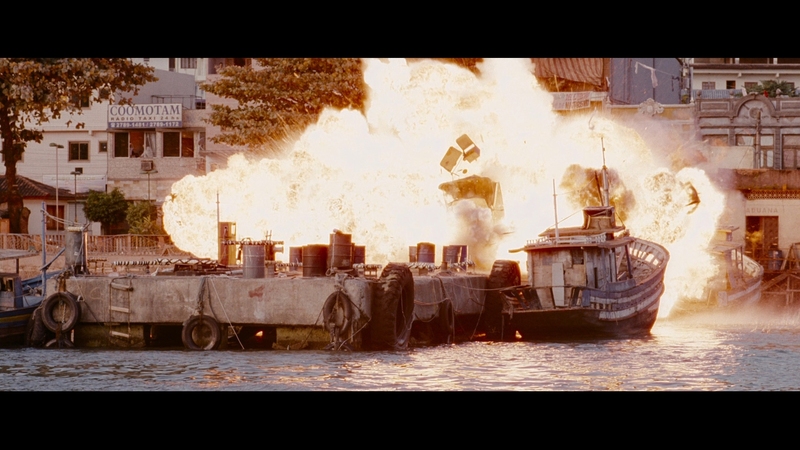 Expendables has one of those endings, where things explode because dammit, there were enough pyrotechnics on set to make it so. That guard tower that is clearly made out of wood? Yeah, that can explode because Terry Crews shot it with a shotgun. That truck sitting in the middle of nowhere? Yeah, that can explode because… no one will ask why. It looks cool. The rather egregious use of immensely visible green screens and pitiful visual effects are the only things putting a damper on this wealth of stupidity and sheer man-filled action. It doesn’t need to make sense, and it doesn’t need a plot because every true movie-going male will find what they need as trucks barrel through a fruit stand. Why? Because it looks cool, and that’s all we need. Expendables comes to Blu-ray with a need to breathe, at times appearing distinctly un-film like, and even then it doesn’t look all that great. The AVC encode at times seems to struggle, although not in the sense of those few establishing city shots, the first at 10:40 that is so pixelated that there is definitely something else wrong, and another at 47:55 so noisy it almost has to be stock footage. The encode’s struggles lie elsewhere, from the poorly resolved grain structure to the wildly inconsistent close-ups. It’s odd too, as the film uses a fine grain stock that barely makes a mark on the overall image. When it is apparent, it never seems natural or clean, some of the final shots of Eric Roberts in close around 1:30:00 notably elevated. As for the close-ups, there is plenty of sweat and grimacing faces to go around; Stallone has no problem requiring his actors to work in-close. At times, there are definitely focal issues, and in others, there is a digital smoothness, Sandra’s (Giselle Itie) close-up at 1:31:40 supremely digital. The scene is backed by a green screen, so it’s likely the effects taking hold, although it’s in direct contrast to the coarse, textured faces of Stallone when the view switches back and forth. Shots with a distance can suffer the same fate, Crews and Couture inside the plane at 1:07:26 looking especially diluted and flat. That’s not due to special effects, nor is a series of Eric Roberts close-ups at 46:06. Black levels are also tricky, wavering in and out with little or no consistency. A scene around the halfway mark as Stallone visits Rourke is especially flat, although the lighting of the shot(s) is distinct enough to let is pass. At the least, there is no sense of crush, even in some of the more intensely lit outdoor scenes. The jungles of Brazil offer a clean, crisp, and defined backdrop at times, especially as the plot picks up some steam around 33:36. To be clear, this is not an awful looking film. There is plenty of depth, and where need be, the color palette shines with some vivid intensity. Many will be pleased with the level of definition in the close-ups, even if few of them match the next. It’s a transfer that is constantly going up and down in terms of its quality, and the only thing that seems to be at fault (minus the aberration that are the effects and any intentional smoothing) is this encode that never gives a sense of full control. Despite a lack of significant artifacting, this rarely looks like film. This DTS-HD 7.1 mix is waiting to make its statement. It has brief flashes of what it can do, from the subtle stereo split of the plane’s engines about 10-minutes in, to a chase at 1:01:00 with some vehicles passing through and engaged surrounds as gunfire begins flying around. There’s even some bass, an explosion on the dock at 44:22 nicely delivering a low-end jolt. It’s nice, but lacking that extra layer, that home run shot to come fully alive. What this track is really waiting for is the nighttime raid, where it’s allowed to take on a new life that it didn’t have before. Those extra surrounds finally becomes useful as guns are fired off underground at 1:19:00, not only echoing but capturing the swarm of guys with automatic rifles as they rain down lead around the viewer. As Terry Crews almost gleefully becomes blowing people up with a shotgun just minutes later, the subwoofer begins putting in overtime, and the fun really begins. There is literally a string of around 20-minutes worth of flawless, crisp, and (forgive the pun) explosive audio to contend with, buildings crumbling with a massive level of bass, guns punching through the fronts as much as they are the sub, and punches so overdone they might as well be grenade launchers. It’s awesome. The score enriches the whole thing, bleeding into the surrounds aggressively but naturally, never lost despite the absurdity of it all. Dialogue is much the same even though this is hardly a time for words, balanced within this intense mixture with care. The latter goes for this entire track. The plethora of extras here is exhausting, and potentially the cause for the lackluster core video (much of it is in HD). 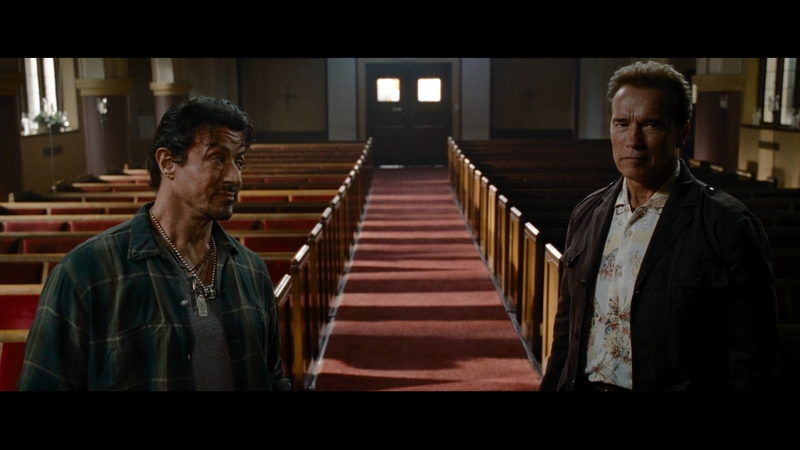 A commentary by Stallone is the least of the major extras, and that’s saying something. Ultimate Recon Mode is one of those great pop-up features, pushing the movie to just over two hours as Stallone breaks in to make his mark, and explain specific shots. Inferno is the making of, a 90-minute look behind-the-scenes that is, most importantly, insightful. Stallone tells why he makes films, his inspirations, and how it’s done. A 45-minute Comic Con panel is also a blast, with the main cast chatting with attendees. Promotional or not, it’s a great watch. From the Ashes deals with post-production, running 26-minutes as it details how films are put together when the cameras stop rolling. A five-minute gag reel and one solitary (wisely) deleted scene are followed by trailers, Metamenu support, D-Box, and LG-Live access.